There are a few ways of paying for a funeral. Most funeral service providers require payment upfront. If the deceased had a funeral policy, the policy details need to be given to the funeral director to verify. If the deceased didn’t have a funeral policy and you cannot afford to pay for the funeral, you can ask the funeral parlour if they can submit the invoice to the executor for payment out of the funds in the estate. However, many funeral services will not agree to this method of payment due to the length of time it can take for an estate to wind up and the possibility that the estate could be insolvent, in which case the funeral director might not receive payment. Some estate administrators will advance the money to pay for the funeral from the estate, depending on the financial status of the individual. To save loved ones the added stress at the time of your passing, Funeral Guide strongly advises all who read this to consider getting a funeral policy in order to cover one’s own funeral costs and consider covering the cost other members of the family. Many funeral policies do make provision for family members. 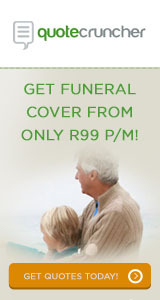 Click here to obtain Comparative Funeral Policy Quotes. If the deceased does not have a funeral policy and the family cannot afford the costs, the other alternative is to consider a short term loan from your own bank or other registered credit provider. If this is the route you are taking, be sure to tailor your funeral to your budget, there are many wonderful ways of honouring the deceased that don’t require a fortune to be spent.